Mohsen Makhmalbaf has always been considered one of the major helmers of Iranian cinema. His career extends in more than three decades and his family is one of the most active in the film industry of Iran since almost everybody is working for the cinema. In 2005 and after the election of Mahmoud Ahmadinejad, Makhmalbaf left the country and now he lives in Paris. His latest work The President has been one of the most anticipated films of Orizzonti (Horizons) section of the 71st Venice Film Festival. The story is set in an unknown country were The President (Misha Gomiashvili) is the absolute ruler. Everything seems to go according to his demands and his young grandson (Dachi Orvelashvili) follows his path. After President’s command to execute the terrorists who killed his son and his daughter-in-law, a series of riots emerge around the country. The citizens declare these events revolution and they demand the head of the President. While the rest of the presidential family escapes the country, he and his grandson decide to remain there. Despite his initial optimism, the President realizes that there is no safe place for them and now he must find the way to save himself and protect his grandson as they pass through the country incognito. With The President, Mohsen Makhmalbaf is clearly creating a direct political satire or in his way a political parable. He tries to use some of his key elements of the past in the storytelling but his mise-en-scene feels quite different. The screenplay was co-written by the director and his long-time partner Marzieh Meshkini and it is no coincidence that bears so many similarities to the actual events of the Arab Spring. As The President’s story unfolds it is clear that the character acts and thinks like the dictators of these Arab countries and he shares some similarities especially with Muammar Gaddafi. The fact that Makhmalbaf chose to work in Georgia gives another aspect to the film since it could be easily correlated with the post-Soviet regimes that have fallen or are still surviving in the ex-Eastern Bloc. That parallelism of the Arab and Soviet countries is probably quite obvious and it could also be the most interesting part of the film since it implies that the story has no borders. The President feels quite unbalanced. The first part looks quite promising as it keeps some of the bitter satire that an issue like that needs. The dictator acts at the most authoritarian way and a little child simply follows his footsteps asking and doing whatever pleases them. Through that premise, Makhmalbaf gives some hints of absurdity that could work subliminally and could offer to the final result an unexpected approach. Some over-the-top scenes and dialogues offer that necessary offbeat humor. Despite the fact that this technique could really work and transform that sublime satire into a great allegory Makhmalbaf decides to choose a complete different path and tone down his film. While the President tries to escape, the story becomes quite predictable and didactic in a simplistic way. There is a constant feeling that there is a series of events presented as disjoined vignettes of that unknown country’s life. The President will meet for the first time some of his subjects, a barber, some vicious soldiers, a prostitute, some ex-convicts and some farmers. Each of these meeting will happen under different contexts. Also the aftermaths of these random encounters will be for him and especially for his grandson a straightforward moral tale which will be presented in the most explicit way possible. To make this moralistic approach even more obvious, Makhmalbaf links these stories and these people to the upcoming society that will evolve after the collapse of the tyrannical regime. He suggest that a new cycle of violence will replace the violent dictator and he doesn’t leave any glimpse of real hope for the future since everything seems to be as corrupted as before but under a different presumption. The President is a film that could be easily misapprehended. Despite the good initial intentions and the excellent performances by Misha Gomiashvili and Dachi Orvelashvili at some point the film loses the magic of the political allegory that struggled to build and follows a safe palpable and probably without surprises path. 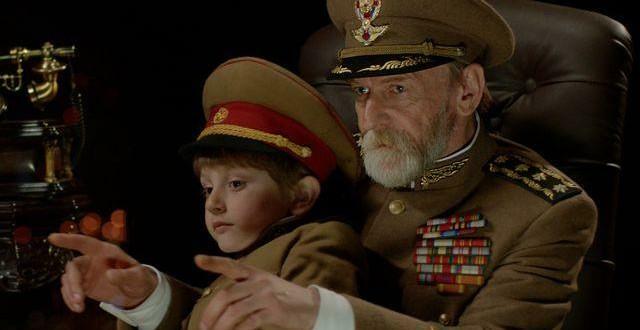 It is not clear if this is a bad historical timing for the film but Makhmalbaf is trying to deal with every possible aspect of his story and he seems like he was lost in translating his own ideas.